The third hole is the first of five par 3s and can look benign from the tee but into a south-westerly wind makes club selection a challenge. Anything from a low iron or equivalent wood could be necessary or a gentle 7 iron with an easterly wind at the back. The surrounding trees subtly shelter the hole from the elements and the choice of club requires careful consideration as beyond the green is a water hazard awaiting the over-zealous strike. The green is protected by four bunkers, two of which are visible from the tee while two remain hidden alongside the green. 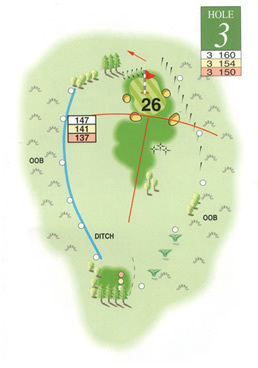 A measured straight shot is all that is required but to the right the Cole Stream borders the hole and is out of bounds and the left hand trees hide a ditch running the length of the hole.